Get A Sneak Peek At SamTrans New Hybrid Buses With Visit To Gillig Plant – Peninsula Moves! 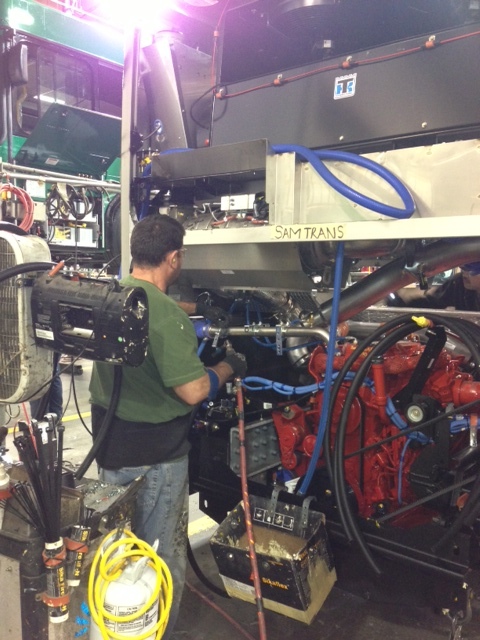 A Gillig worker installs a Cummins engine into a new hybrid SamTrans bus. From three pieces of metal to a fully-functioning transit vehicle in less than 10 days: That’s the story of SamTrans’ new fleet of hybrid buses. In January, SamTrans’ Board of Directors approved a plan to purchase 25 diesel-electric hybrid buses, the first of their kind at the agency. That was phase one of a $32.2 million initiative to integrate 62 new vehicles into the SamTrans fleet. While SamTrans’ passengers await the arrival of the new buses, the hybrid vehicles are being painstakingly assembled at Gillig’s manufacturing plant. The Hayward-based company was awarded the contract to build the buses. SamTrans public affairs team was able to visit the Gillig plant to get a glimpse into all the work that goes into constructing the state-of-the-art vehicles. Initially, the buses arrive at the Gillig plant as three sections of steel, which are then bolted together to form the chassis, which acts as the vehicle’s internal framework. Once the chassis is completely bolted together, the assembly line production begins for the hybrid vehicles. At first, materials like outriggers, brackets, exhaust systems and suspension networks are added to the chassis. Following that, the engine and transmission is installed to the frame, and by the time the fuel tank and wheels are added, the process has taken about a day. The radiator is added and the wheels get mounted on the second day, and then the battery pack is assembled and installed, alongside the steering wheel. At this point, the bus is ready to have its roof added, a process that can take a full day. The roof is built upside down, starting with a bare frame, before its interior skin is glued down, insulation is added, grab bars are affixed and air tanks and antennas are added to the top of the roof. With a completed shell, the interior work on the bus begins. Floors are laid down, wiring is connected and the electrical components are tested to assure they work. The engine is programmed to work specifically for SamTrans, and the underside is meticulously inspected for any potential problems. When the bus is finally ready for its shiny coat of paint, it has been about five days since the materials were first assembled. Because the SamTrans buses require multiple colors, the paint process is lengthy, often taking two to three days to completely finish. 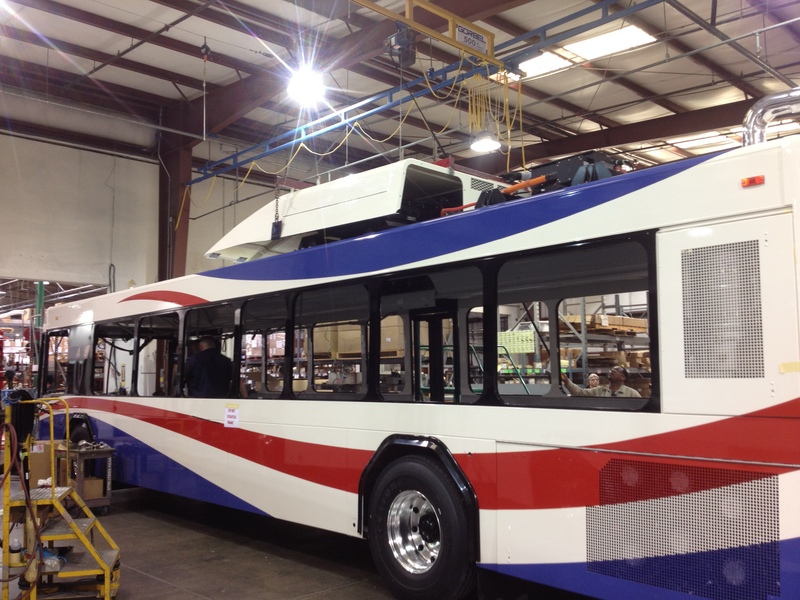 A new SamTrans hybrid bus nears completion. After the paint has finally dried, the seats are installed and the front windshield is mounted. Technical features, like security cameras and electronic tracking systems are equipped, followed by wheelchair ramps. By the end of the final inspection—which includes a diagnostics and road test—the entire process from start to finish has taken a grand total of 9 ½ days. From raw material to finished bus in just under 10 days, we think that’s pretty impressive. As a bus agency committed to sustainable transportation practices, SamTrans is proud to partner with the Bay Area-based Gillig, which is going to great lengths to assure the quality of these vehicles. The diesel-electric hybrid buses will produce 90 percent fewer NOx emissions than the 1998 buses they are replacing. Not only will SamTrans improve its environmental standards by purchasing the hybrid buses, the bus agency has also opted to support a local manufacturing company in Gillig, which is based solely in the East Bay city of Hayward. 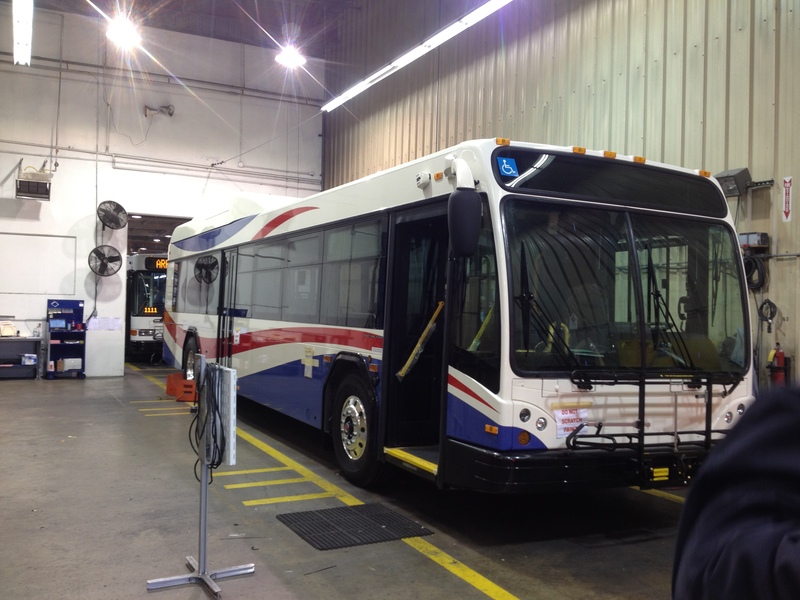 A SamTrans hybrid bus nearing the end of assembly in Gillig’s Hayward plant.